Fast, reliable and extremely accurate, the Avery Weigh-Tronix ZK830 high resolution checkweigher has been created with the user in mind, with easily operated under, over and accept bands and a PLU target weight database capable of holding up to 40 target weights. Designed with prominent under, over & accept bands, the operator can quickly set the ZK830 up to identify when the required weight has been reached. 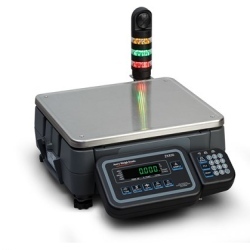 The ZK830 available from authorized Avery Weigh-Tronix distributor Central Carolina Scale, can quickly display weight within an accepted band at a glance, for a fast and efficient checkweighing process. Designed with prominent under, over and accept bands, the operator can quickly and easily set the ZK830 up to identify when the required weight has been reached: ideal when repetitive check weighing is required. When fitted with a remote keypad, the ZK830 can store up to 40 individual PLU target bands along with any required tare weights.